Github, the online version control repository host for Git, recently added support for GeoJSON files. Sounds boring, right? It actually lets you do something very cool: build your own “dots on a map” website with virtually zero code. An example of GeoJSON on Github I whipped up. Click it. Get a Github repository if you don’t have one already. They’re free. Create a GeoJSON file. You can export to this format from various tools. One easy way to get started would be to upload a CSV file with locations to dotspotting.org then download the GeoJSON from there. Or even easier, use geojson.io to place dots, lines and polygons with a graphical tool. It can save directly to your GitHub. It’s worth validating with GeoJSONLint. 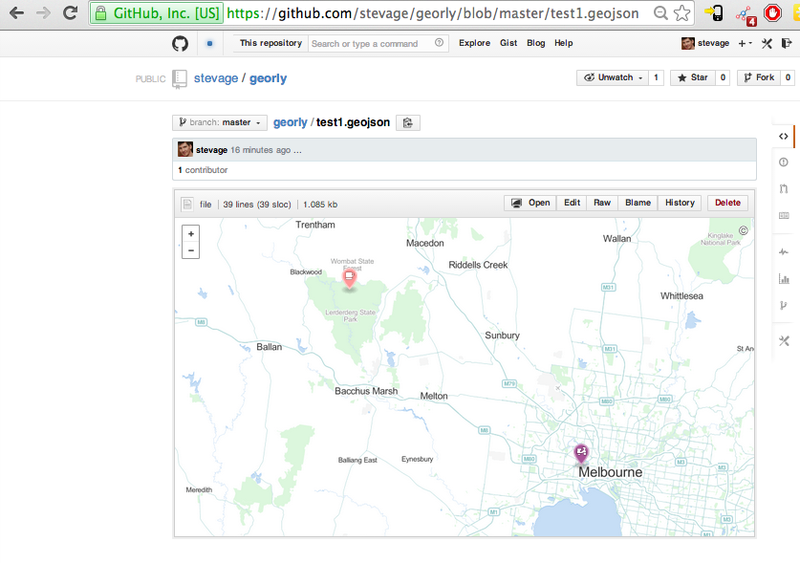 The test GeoJSON file, as seen on GitHub. If you don’t have a website, site44 is an extremely easy way to get started. You place HTML files into your DropBox, and they get automagicked onto the web, with a subdomain: something.site44.com. Commit your changes to your repository. I accept the changes, and voila – now your points are shown with mine. Using this method, we have a “review before publish” workflow, and a full version history of every change. Obligatory “rendered with (heart) by GitHub” footer. Soon you’ll want to build a proper application, using tools like MapBox, CloudMade, CartoDB, Leaflet etc.